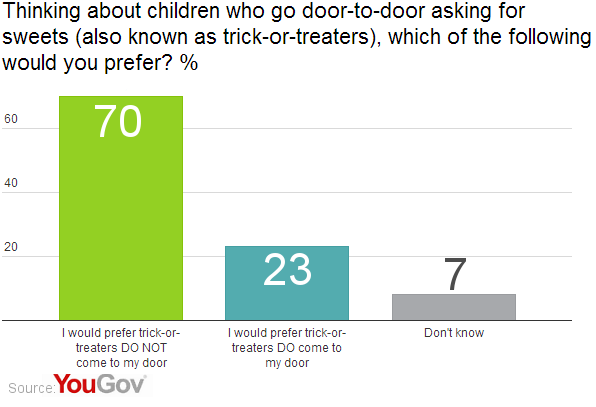 October 31, 2013, 9:44 a.m.
As children get ready to dress up and celebrate Halloween this evening, a new YouGov poll reveals a very high degree of negativity about the holiday from most of the population. The festival, considered devil worship by some, has long been a fixture in the US calendar, but is a relatively new addition in the UK, with retail spending on Halloween having skyrocketed from £12m in 2001 to over £300 million last year. Despite this rise in spending, the research reveals that only 22% of British adults will be celebrating Halloween, although the number is higher with 18-24 year olds (40%) and 25-40 year olds (31%). If you thought it was ok for kids go out and knock on doors this Halloween; think again. The vast majority (70%) of UK adults would prefer it if kids don’t come to their door, just 23% are happy for them to. When presented with a list of ideas for celebrating Halloween, most Brits draw the line at children dressing up within their own home. 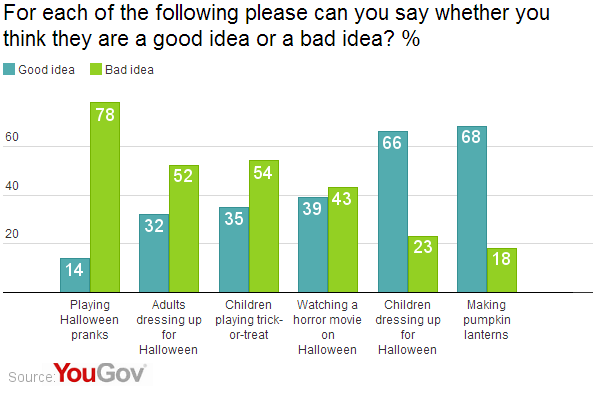 Playing Halloween pranks (78%), adults dressing up (54%) and trick or treating (52%) are all considered a &apos;bad idea&apos; by a majority of British adults; the only activities deemed a &apos;good idea&apos; are making pumpkin lanterns and children dressing up. People in Britain are even split on whether watching a horror movie is a good or a bad idea, tending towards the latter by 39%-43%. Resarch by YouGov America has found that, in comparison, nearly 59% of Americans have plans to celebrate Halloween. Of course in Britain the holiday must compete for space on social calendars with another, quintessentially British celebration: Bonfire Night. There is even evidence that some of the traditional rituals associated Halloween, such as the lighting of fires and the eating of cakes, were long-ago transferred to the 5th of November.